Creating a dry, healthy space, is very important before you continue with your basement finishing plans. 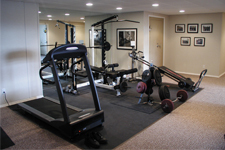 How do you create a dry healthy space in your basement? It's easy! This is important to stop water vapor from permeating in through the porous concrete and making your basement feel and smell bad. If you're finishing basement walls with drywall, first install the ThermalDry® Wall system against your basement walls. This vapor barrier reflects 97% of indoor heat back into the basement, thus making the living space more energy efficient and comfortable. 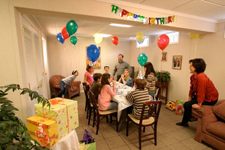 A basement finishing system such as the Total Basement Finishing product is a great alternative. If your going to put down carpeting on your basement floor, first install ThermalDry® Basement Floor Matting beneath the carpet. This has two great benefits. First, it creates a thermal break between the concrete floor and the room, thus making the floor and the entire basement easier to heat. Second, the matting stops water vapor form permeating up into the basement. This doubles the lifespan of your carpet that would normally sit on the dank concrete floor. Now you have a comfortable, dry, warm basement floor that you'll have no problem sitting on... even in the winter! In most areas of the U.S. and Canada, relative humidity gets pretty high in the summer (even the spring and fall) and uncomfortable in a basement. Musty smells caused by mildew are aggravated in high relative humidity. Dehumidifying the space effectively and efficiently is the solution. The SaniDry™ Basement Air System is powerful enough to do the job, removing 100 pints of water per day with a 255 cfm fan to really dry out the entire basement - up to 3000 square feet of space with an eight-foot ceiling - and yet, the SaniDry™ has an Energy Star rating, running on 6.8 amps (typically what a 35-pint dehumidifier runs on). If you're going to invest a significant amount of money, or store valuable items in your finished basement, you may want to consider a basement waterproofing system. As we know that most basements leak over time, this would give you peace of mind to use your basement for anything you desire without fear of your valuables or investment getting ruined. Don't compromise on what to make out of your dry basement. With the complete ThermalDry® System and a SaniDry™ dehumidifier and air filtration system, relative humidity can be effectively maintained. Now you can create a music room, create a space for your stamp collection, store your family photo albums... things you wouldn't dream of doing in a wet, damp, or musty basement, finished or not! Once dry and comfortable, you're ready to complete your basement finishing plans. By being dry, you won't have to worry about what to put in your finished basement space.